BROTHER ALI STAR QUALITY LYRICS"
My styles a little belligerent, isn't it? 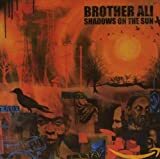 "Oh Ah Hey, Oh Ah Hah"
All Brother Ali - Star Quality lyrics are property and © copyright of their respective owners. All Star Quality lyrics provided for educational purposes only.